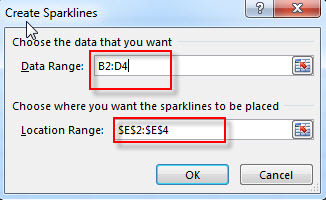 This post will explain that how to insert or create a Sparkline in one certain cell based on the selected data range in Excel. How to create a Line Sparkline in one Cell. How to create a Column Sparkline in Excel. How to change the Sparkline type from Line to Column type in Excel 2013 or Excel 2016. How to change the Sparkline style for an existing Sparkline. The Sparkline is mini chart placed in single cell, and each chart representing a row of data in your selection. 2# go to Insert Tab, Click Line button under Sparklines group. 3# the Create Sparklines window will appear. Then choose the data range that you want, such as: B2:D2. 4# click Ok button, then let’s see the result. 2# go to Insert Tab, Click Column button under Sparklines group. 3# the Create Sparklines window will appear. Then choose the data range that you want, such as: B2:D4. 2# go to Insert Tab, Click Win/Loss button under Sparklines group. 3# the Create Sparklines window will appear. 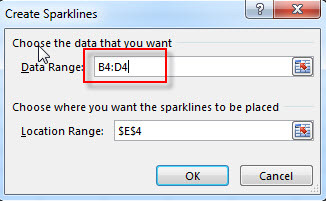 Then choose the data range that you want, such as: B4:D4. 2# go to DESIGN Tab, click Column button under Type group. 3# let’s see the result.